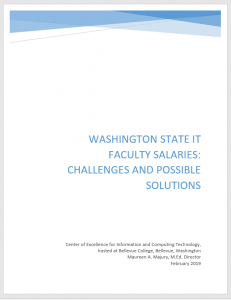 The Center of Excellence for Information and Computing Technology, hosted at Bellevue College, serves 32 of the 34 Washington state community and technical college’s (CTCs) Information Technology (IT) programs. Consistently, and persistently, the Center has heard from community and technical college workforce administrators, professional and technical deans, and IT faculty how difficult it is to recruit and retain IT instructors. The reality is IT (included within Science, Technology, Engineering, Allied Health, and Math (STEAM)) industry professionals make substantially more money per year than IT faculty. Thus, attracting and keeping talent within IT programs is a challenge. This impedes opportunities to expand IT programs of study in new and emerging technologies, and to prepare a pipeline of talented employees for industry. This year the Center engaged with faculty unions, the State Board for Community and Technical Colleges (SBCTC), CTC IT faculty, workforce administrators, and union representatives/presidents to consider and pose potential solutions and challenges. Click on the report cover image to read the report. This report will be reviewed and discussed with IT faculty in small groups at the May 16-17, 2019 IT Futures Summit.